Mike Mulvey – “I love it when a plan comes together”. When Mike Mulvey was appointed coach to the Brisbane Roar he had some big shoes to fill. Many fans coming from a culture of entitlement felt duped and were less than enthusiastic about his appointment and openly feared that he would advise an English style of football. He was met on the opening game of his appointment with a banner: “Mulvey.Out! (see footstool placement). 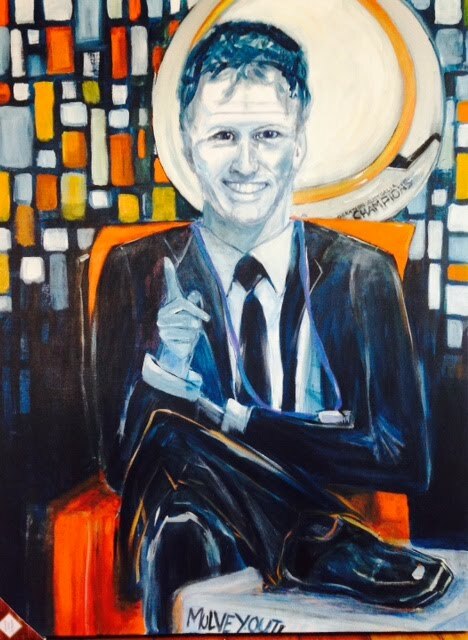 I have painted Mike as confident, happy (although he is normally poker faced), “true blue” – a prophet in his own land (football) and more than filling the shoes of his predecessors. I have referenced a religious pose, with stained glass windows doubling as a crowd, a Brisbane Roar coloured throne and the A League Champion’s Trophy as a halo. An engaging and confident Mulvey has crushed any doubts anyone had about his ability to bring the team to winning status. Yet this is just part of his plan – he is enthusiastic about developing youth. (again, see footstool banner placement). Mulvey is humble and well spoken – you will not find anyone who has a bad word to say about him. My first meeting with him came about when he came to open a local football field earlier this year. It was the week before semi finals and I couldn’t believe he would take time out for such a grassroots activity.